SOLIDWORKS Flow Simulation is great at modeling the physics around us. It’s a tool that we can use to help us make informed design decisions. By running different what-if scenarios, we can figure out the best way to design our products, but it doesn’t have to stop there. The physics don’t stop working because it’s after 5pm or the weekend. For example I had a choice to make for an upcoming trip to go kayaking in Islamorada in the Florida Keys. I could drive my kayak from Fort Lauderdale or rent one in Islamorada. 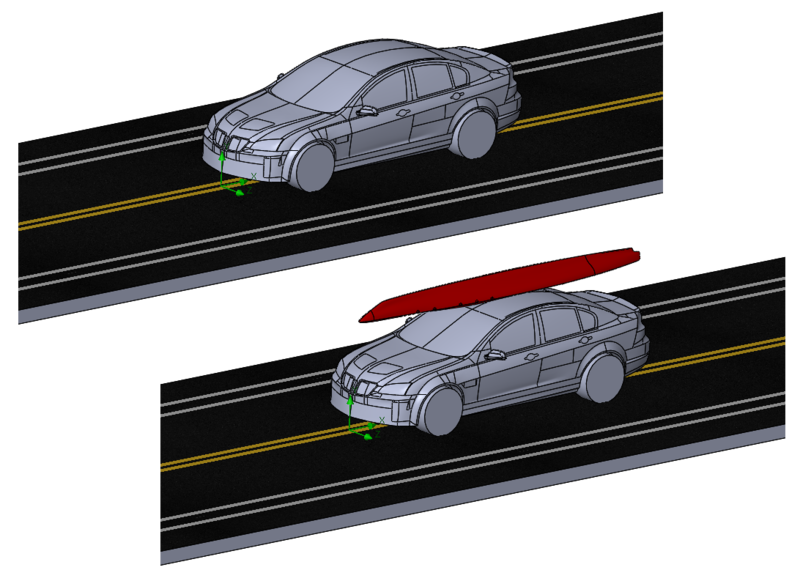 So, I took to SOLIDWORKS Flow Simulation to figure out just how much less efficient my car would be with a kayak on top. With the information from Flow Simulation– these virtual wind tunnel tests– I could make the most cost effective decision, something that should sound all too familiar to so many designers and engineers. By setting up two realistic scenarios (and one very unrealistic), I was able to see what effect the kayak had on the drag force, which ultimately is what causes a decrease in my gas mileage (fuel economy). Check out the video below to see just how I was able to do this. After running these different scenarios in flow simulation, I was able to figure out how aerodynamic my car would be before I drove a mile. It was a very simple calculation to figure out the drag on the car using the equation for drag coefficient. 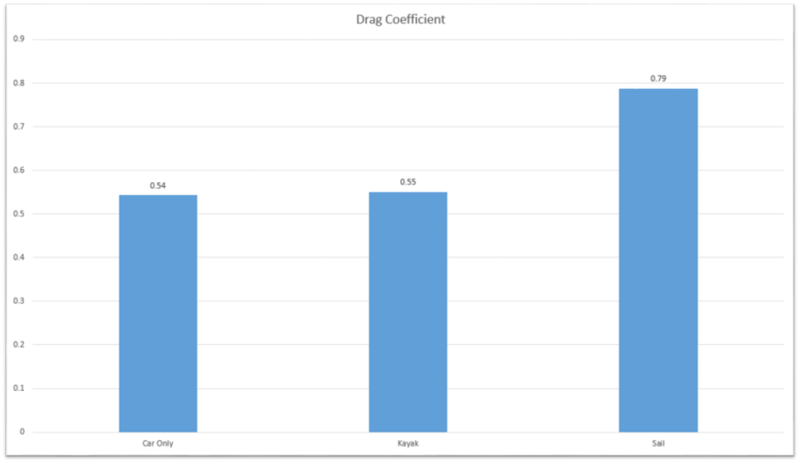 The table above shows my results for the drag coefficient. These numbers were determined by taking the drag force found by Flow Simulation and using the drag coefficient equation which included the cross sectional area, density of air, and car’s velocity. As expected the vertical orientation added a whole lot of drag to the car. But surprisingly, there was only a slight difference in the drag with and without the kayak. With this information, I know that the most cost effective way for me to enjoy the Keys this weekend is to drive my Kayak to Islamorada. Maybe if I didn’t live so close to the Keys it’d make more of a difference, but for this short drive I’ll have my own kayak strapped to the roof.